Highly systemised artworks have drastically changed the way they place themselves in the room since Donald Judd's connected cubes stepped across the wall in 'Primary Structures', a 1966 exhibition at New York's Jewish Museum. Back then you could weigh a sculpture's posit and position with certainty. Its austere, macho minimalism asserting the clarity of one, single-minded solution. Surefooted declarations have since been replaced with questions, plurality, ephemerality and a slightly intimidating overlap between sculpture and other practices, disrupting expectations and defying categorisation. One curator who has showcased a number of these tricky works is Rosalind Davis. As in-house gallerist for London law firm Collyer-Bristow, she orchestrates three exhibitions a year. While her curatorial platform is focused on helping emerging artists build their profiles, diversification through exhibiting works of practitioners from their early 20s to mid 70s has helped create a cross-correlation of ideas and networks. Her exhibitions are also mindful of their location. Situated in a law practice, Rosalind acknowledges 'there are lots of links between lawyers and artists - we both have to be creative, problem solve and analyse'. With a nod to imaginative thinking and doing, her 2017-18 show 'Make_Shift' ricocheted off American artist Richard Serra's 1967-68 'Verb List' - itself a call to action guide for the making process - and included contemporary artists Andrea V Wright, Silvina Soria and Andrea Medjesi-Jones. Andrea V Wright's sculptural arrangements slip naturally into peculiar bodyscapes from her background in apparel by 'layering dialogues that relate to design, architecture and fashion'. It's as if she's peeling back the skin and picking apart the remains to understand what's there, what's underneath. The further she investigates, the more skeletal the form and the more it appears to delve into the details of matter in space. 'Vertical Ascension' 2017 is stripped to its bare bones, all limbs and elbows. The expanding, contoured shapes allow air to flow through and around them, activating both as equals. She refers to these as 'impossible planes' using illusion, light and shadow which interact with their surroundings. At times, visual trickery makes it almost impossible to delineate between dimensions, lines in space and lines on the walls. An immersion goes on between the object, the image and the architecture. As if the latter is internalised as part of the object. Perhaps too, as if we internalise the place in which we are situated as part of our identity. Another artist concerned with outlines and outliers is Silvina Soria who creates drawings in space using steel rods, wire, threads and cables. 'Rooting I' 2014 introduces one of her complex structures which, she explains, 'emerge from a nuclear centre and expand centrifugally', building up to a 'mobile cartography'. Using industrial materials, her practice revolves around creating 'underground landscapes'. The puzzling pathways of Silvina's work provoke questions around the structure of concealed systems which power, shape and control our access to services of everyday use, from underground train mapping to network wiring. Who controls their design? Who controls access and exemptions? Are we manipulated into circulating only within its parameters? A nearby step leads to hidden wireless networks which have the device operating independently, behind its friendly interface. While some structures are beyond our sightline, others rule our independence. Andrea Medjesi-Jones's 'Pink Painting Machine' series conveys enclosed rigidity where a paradox arises as the individual who participates in the system becomes an anonymous part of its construction. Then, just when you think there's no way out, that same system becomes as vulnerable as the brittle surface pigment. 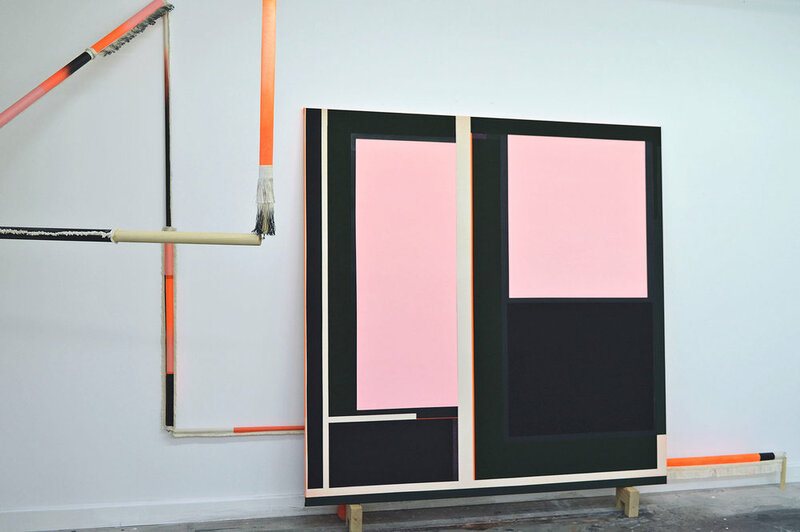 Her painting uses a particular shade of pink as flesh, which is placed within a windowed structure, providing both containment and constriction. Propped against the nearby wall are wooden poles wrapped in remnants of unpicked canvas, proxy to the production of the painting. The work prompts Vincent Van Gogh's 'The Harvest' 1888 with its rectangular fields and objects of workmanship - ladder, wheelbarrow, fencing. As well as George Stubbs's 'Haymakers' 1785 where white-frocked landworkers, supported by rakes and forks, tumbleweed across the canvas in a composition of perfect diagonal balance. Though critically, Andrea is not upholding a romantic view of labour. Instead, she characterises her work as 'situating the body within cultural and bio-political codes of production, instead of individual networks and relations'. It's all about the framework, not the person. Rosalind Davis also observes this tension between the personal and the order, beginning with a focus on public housing. Aside from her curatorial work, she is a published author and an artist in her own right. Her practice has developed from an exterior view of buildings to stepping inside the room and exploring the space within. 'Haus Constructiv' 2017 is a modular structure of steel, perspex and thread. It plays off last century's constructivist and concrete artists to create a transformative piece which looks to fold, shift, disassemble, lean and reconfigure itself with endless possibilities. Rosalind relates this to her earlier paintings of brutalist and modernist buildings as if she's 'taken the structure and pulled it out and turned it into a sculpture'. Watercolour drawings were a crucial prolepsis to the piece. Indeed the 'drawing in space' nature of the work is upheld when seen through a camera lens. Steel rods become black ink lines while the semi-translucent plastic panels appear as watery paint washes. One functions to hold the piece together; to give it strength. While the other pulses an electric charge of light around the room. Together with its ability to change composition, there is a circular narrative portraying how we move through space while adapting to structure and how we adapt structure to the way we move through space. So there's an ongoing negotiation between our perspective of being external to the structure and our bodily experience of interacting with it. These four artists broaden what was once referred to as "form" into "formation". From a singular shape to an emergence of bringing something or some things into existence. As a result, their work becomes a little more difficult to interpret than their predecessors but is all the more liberated and democratic for it. They have progressed from the mantra of the minimalists who insisted on dealing with only what was in front of them, or, in the words of Frank Stella, 'what you see is what you see', to acknowledging the body, the present unseen and personal histories. These are all arguably and equally what is there in the moment alongside the materials for making. Renowned minimalist Richard Serra was heavily influenced by his experience of working in steel mills as well as going to the shipyards with his Dad. As for anyone, artists have some awareness and subconscious understanding which they bring to the development of their work. And as non-gallery art programmes evolve, such as the one headed by Rosalind Davis at Collyer Bristow, a place is ensured for these artists to not only show and sell their work, but to permeate a working environment, challenging knowns and unknowns for employee and artist alike.